Whether you have got a Careless Driving, Stunt Driving, Speeding Ticket, No Insurance, or any other traffic ticket in Owen Sound - we can help you. Our team of experts on traffic ticket defence in Owen Sound has been successfully representing, and winning, traffic ticket cases at the Owen Sound courthouse for over a decade. The primary objective of all our agents is to, first and foremost, seek to keep your driving record clean. We do this by working hard to get you a full withdrawal of all charges, from Careless Driving to Seatbelt offences. However, in the event that this is not possible, our agents will always work to get your charges significantly reduced to save your demerit points and prevent insurance rate increases. We believe that there is no such thing as a charge that is too big, or too little, for us to fight. We are proud to offer everyone a free, no obligation, consultation in order to personally review your case and provide you with an honest, and straightforward assessment of your traffic ticket and your chances for having it defended in court. 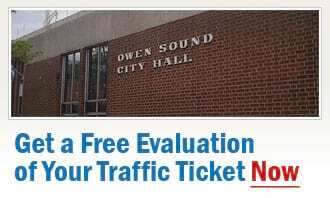 Our team of experts on traffic ticket defence in Owen Sound has already helped hundreds of people that received a traffic ticket in the Owen Sound area. It is likely that we can help you too. Contact us today for your free, no-obligation traffic ticket consultation, as you have nothing to lose, and you have a chance to save your money and your demerit points.